The AZ Fine Art Expo is quickly approaching. Only 6 weeks to get ready for this 10 week show. We are working feaverously to have enough pieces for the entire 10 weeks. This high-end show with about 100 artists, exists of mostly painters, but there is a variety of other artists, such as bronze, metal, clay, leather furniture and just a few other wood artists. We plan to have both our Bentwood and Shangrila II rockers at the show. Not sure what other furniture pieces we will have time to get done, but most of our booth will consist of the Sculpture and wall pieces. We do have the opportunity to work at the show, so this will enable us to add more pieces throughout the show. 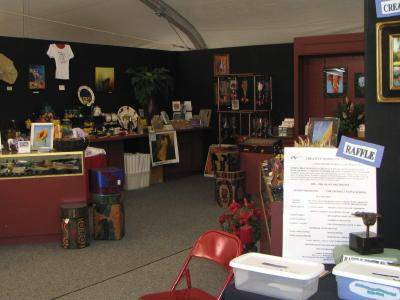 The show also has a Market Place, where artists can place a few of their smaller items for sale. That way the booths are free for the larger higher end work. 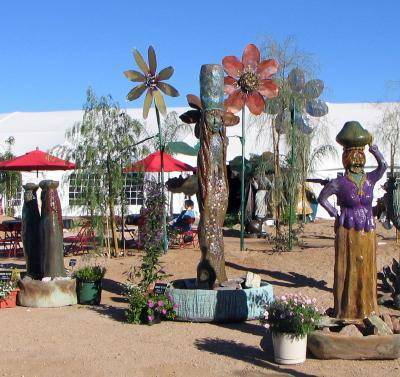 The outdoor Sculpture garden also consists of a café, Koi pond and the artist working cabanas. This is where people can come and watch us work on furniture and sculpture pieces. We are so excited to be a part of this premier show and to get away from our harsh winters. We were able to buy my sisters rv, which has plenty of room for the three of us. Being able to stay right at the show with Sampson is a huge bonus. We hope this show is good for us, so we can continue to go back. For more information on the show, see pictures and videos visit the following links. Or better yet, come visit us. Out of 242 artist submissions, with only 50 pieces being accepted, two of our pieces (Bentwood Rocker and a Carved Vessel) were accepted. 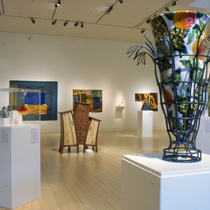 This exhibit is of a variety of contemporary artwork by renowned artists across the United States. We feel very honored to have been selected to exhibit. All work is for sale and will be on display from January 27-March 18 2012 at the Mesa Museum in Mesa AZ. This exhibit works in conjunction with our Scottsdale show, so will enable us to be at the preview party and be able to tell people we will be at the AZ Fine Art Expo for them to see more of our work. The Bentwood rocker we will have on exhibit will be made from Cherry and Ash and the carved vessel is Alligator Juniper. Just a couple of local celebrities that frequent the exhibit. For more information on this exhibit, please visit the Mesa Museum website. You are currently browsing the Shangrilawoodworks's Blog blog archives for December, 2011.